Numenera was the hit RPG of 2013. Published by Monte Cook Games, it describes a world a billion years into the future in the Ninth Age, drastically changed by huge advances in science, but whilst the evidence of those changes is all around, the understanding of the science has long been lost. This does not mean that it cannot be regained and Numenera is all about discovering the great secrets of the past and using them to make a better world. Examples of this technology include Cyphers, one-use devices that the player characters can freely find and use for strange magical-like effects and there are lots of Cyphers to find and use, so the player characters are encouraged to use what they find—there will always be more. In essence, Numenera re-invented Dungeons & Dragons-style play, but in a Science Fantasy setting and combined it with accessible, player facing mechanics that allowed the GM to focus on storytelling. With the inclusion of some fantastic artwork—and every release for Numenera is superbly illustrated in full colour—that beautifully portrays the far future world of Numernera, you have an RPG setting with both scope and grandeur. Now, some three years after it was launched, the Numenera line has an introduction to the RPG. The Numenera Starter Set comes richly appointed with a rulebook and an adventure book—both thirty-two pages long, five pre-generated characters, two dice, ten XP cards and twelve GM Intrusion cards, and a cheat sheet. Everything is presented in full, vibrant colour, with both the books and the cards being on high quality paper or card. ‘Numenera Starter Set Book 1’ is for both the players and the GM. It explains about the world of Numenera, about your character and how to play the game, combat, and how the focus of the game is on exploration and discovery versus combat. Essentially it condenses the first part of the core rulebook and the only thing that it is lacking is a good example of actual play. ‘Numenera Starter Set Book 2’ is the GM only and explain more detail about mastering the game, cyphers—including twenty examples, how to be a Game Master, as well as giving a monster or two, mostly as examples. Oddly it places the scenario ahead of everything in the book bar mastering the game—and that is only a page long. All of the advice comes after the scenario, which seems strange. The production values of both books are undeniably nice, yet so far, so good, because the real oddity is the scenario. In ‘Vortex’ the player characters encounter members of a religious sect who pray before a strange structure and then disappear inside before it too disappears. Afterwards, the player characters do find clues as to where the structure will reappear and following a encounter or two on the way, can find it again. At which point one a woman rushes out and begs for their aid. She wants to escape the sect, but her brother is still inside. The rest of the scenario involves exploration of the structure and confronting the other members of the sect as well as its leader. This is where the scenario ends. The second part can be downloaded from the Monte Cook Games website and played through to its conclusion. Now if you are thinking, that scenario sounds awfully familiar, then that is because it is. ‘Vortex’ in the Numenera Starter Set actually turns out to be the first half of Vortex, the scenario that Monte Cook Games used at GenCon 2013 to launch the game. It is a good scenario that works if the player characters can be enticed to follow it through, the main problem being having reason enough to follow the clues to the strange structure’s second appearance. Perhaps the women wanting help could leave a note the first time? The five pre-generated characters are also printed in full colour and reflect a good mix of the game’s charatcter types—Glaives, Jacks, and Nanos—essentially the equivalent of warriors, thieves, and wizards. They are a Strong-Willed Jack who Commands Mental Powers, a Strong Glaive who Wears a Sheen of Ice, an Intelligent Nano who Leads, a Stealthy Jack who Explores Dark Places, and a Swift Glaive who Wields Two Weapons at Once. Each character comes with a background so that there are connections between them, explanations of the core mechanics, what each can do in terms of skills and special abilities, and the cyphers owned. Each is simply and cleanly laid out, easy to read, and much easier to use than the character sheet in the core book. The dice consist of a twenty-sided die—for handling actions, and a six-sided die—for handling effects and levels of Cyphers and so on. There is nothing more to say about the dice except that the twenty-sided die is not a Numenera twenty-sided die. Which is a pity. The cheat sheet is the only thing not printed in colour and oddly is printed on relatively thin paper compared to the thick card of the ‘Before You Start…’ card that explains the contents of the Numenera Starter Set. It is absurd that the thing you going to look at once is printed in a more durable and prettier format than the thing that you are going to handle again and again as you play the game. Plus, why not do one of these for each of the players? The XP cards and the GM Intrusion cards are both nice and simple, the GM Intrusion cards nicely providing ideas to complicate the lives of the player characters and so earn them XP. Physically—apart from the Cheat Sheet—the Numenera Starter Set is nicely presented. It is well written, although perhaps one piece of largish art could have been replaced with a good example of play to show prospective GM and player alike how the game works. 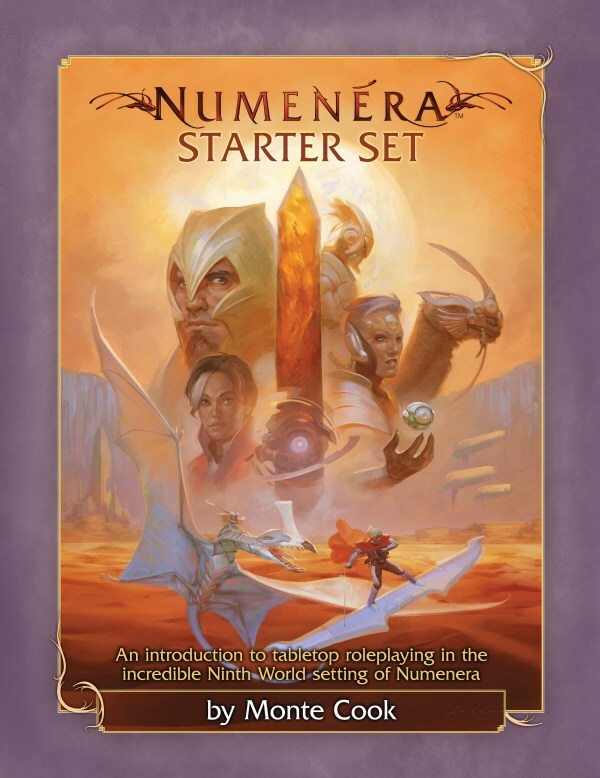 So the first question is, should you buy the Numenera Starter Set? The answer to that question revolves entirely around the scenario, ‘Vortex’. If you have never played Numenera and do not want not to pay the full price for the rulebook, but do want to get playing quickly, then yes, the Numenera Starter Set will be of use. Be aware though, that you only be getting one half of a three year old scenario in high quality and with a poster map. The other half you will need to print out yourself. Also be aware that for just a little more than the cost of the Numenera Starter Set, the Numenera core rules and the full scenario, ‘Vortex’, can be purchased as PDFs. If you have played Numenera or own the Numenera core rules, then no. Perhaps the pregenerated characters and the extra XP cards and GM Intrusion cards might be useful, though not at the given price for Numenera Starter Set. Perhaps the Numenera Starter Set might be worth adding if you are a completist, but it really does not add anything to anything you probably already have in your Numenera collection. That said, if you do not have ‘Vortex’, then spend your $5.99 on that. It is after all, a good scenario. If you own or have played ‘Vortex’. Definitely not. Especially since the version of ‘Vortex’ in the Numenera Starter Set is only half of the scenario. Which begs the second question, who exactly is the Numenera Starter Set aimed at? Essentially it is for people who have not played Numenera, whether they have roleplayed or not. Which is fine except that why include half a scenario? Why not include the whole scenario and put its map on the other side of the poster map included in the Numenera Starter Set. Then include another scenario as the follow on to download from the publisher’s website. That would extend the play capacity of the Numenera Starter Set beyond the couple of session’s worth just in the box. Indeed, why include a three year old scenario in the Numenera Starter Set at all? Let alone split in two and half the production values on the second half? Why not include a new scenario, one that would could better serve players and GM alike who are new to the RPG and then another that could be downloaded? Or perhaps include a series of short adventures or encounters as in the supplement Weird Discoveries: Ten Instant Adventures for Numenera and then include a longer adventure as the download? Do that and not only do you serve the new players that Monte Cook Games so clearly wants to attract with the Numenera Starter Set, but you give a reason for veteran players to look at the Numenera Starter Set rather than ensuring that they have no reason whatsoever to do so. Now one of the tenets of writing reviews is not telling the publisher how it should be done or how the reviewer would do it. In the case of the Numenera Starter Set it is so very difficult not to do that because it is such an odd product of such a restricted market and use. Especially when there are examples of beginner boxes for RPGs which do this better and a veteran publisher like Monte Cook Games should know better. Ultimately the choice of scenario in the Numenera Starter Set undermines its value and restricts its potential audience; more so when there better value for money options available for Numenera.